Want that dream job? Volunteer! It’s a fiercely competitive world out there, particularly when it comes to finding fulfilling employment. Why is that? Jobs these days require 3-5 years experience in the industry before you even start. So how do you get experience to make yourself more employable? Volunteer! Local volunteers Ian and Roma Edwards are just two of 6 million volunteers being celebrated as part National Volunteer week this May. Ian and Roma Edwards stand in their Indigenous garden. The couple, who founded local volunteer group Jan Juc Coast Action (JJCA) in 1994, have been working to protect and restore the Jan Juc cliffs since they moved to the town in 1990. 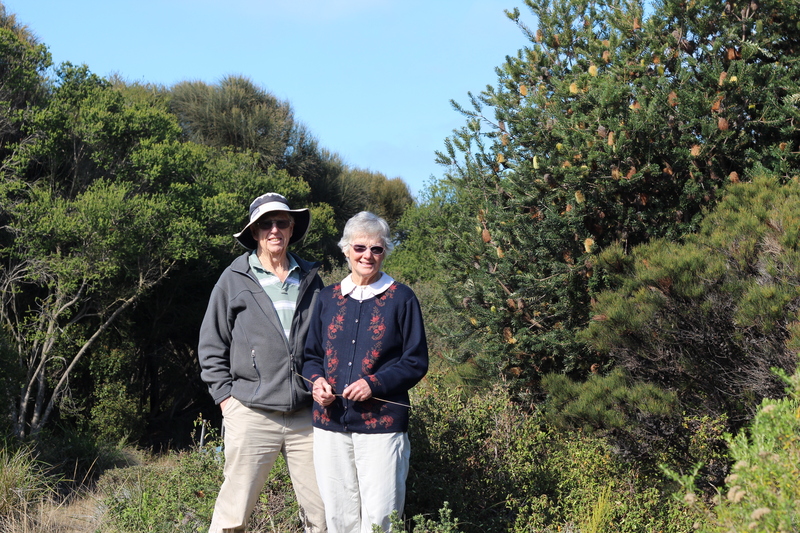 The Edwards began by removing debris and rubbish along the local foreshore and their dedication was recognised by the Victorian government which awarded the couple a $30,000 grant to form the JJCA group and continue their conservation work. The JJCA’s first major task was to remove the woody weed from the Jan Juc cliffs before revegetation works commenced. The Edwards are pleased at the progress the JJCA group has made over the past 20 years. “One of our biggest achievements has been seeing the return of many birds and native animals around the Jan Juc cliffs. “The indigenous flowers have attracted the rare Rufous Bristlebird back to the area which is very encouraging,” Mr Edwards said. The Edwards have loved learning about coastal conservation and enjoy sharing their skills and knowledge with others. Mrs Edwards admits their passion for indigenous flora and fauna has become an obsession that has extended to her own garden. “Our garden only has indigenous species because they are easy to look after and bring lots of birds and wildlife to the area. “The results of our work is difficult to gauge because if it is done correctly then it should be impossible to tell that any work has been done at all,” Mrs Edwards said. JJCA holds working first Sunday of each month and everyone is encouraged to help out – even if they only have an hour or so to spare. “It is great to see more young people getting involved. They still have their original hips and plenty of energy which keeps our work going. “It is possible to make a difference and even small actions can make a big impact,” Mr Edwards said. This year, National Volunteer Week runs from 11th to 17th May. This year the theme of the week is ‘Give Happy, Live Happy’ – promoting the increased happiness of Australians who volunteer and are active in their community. Have you ever thought about how you can help the environment? Check out our website to find your local volunteer group today.